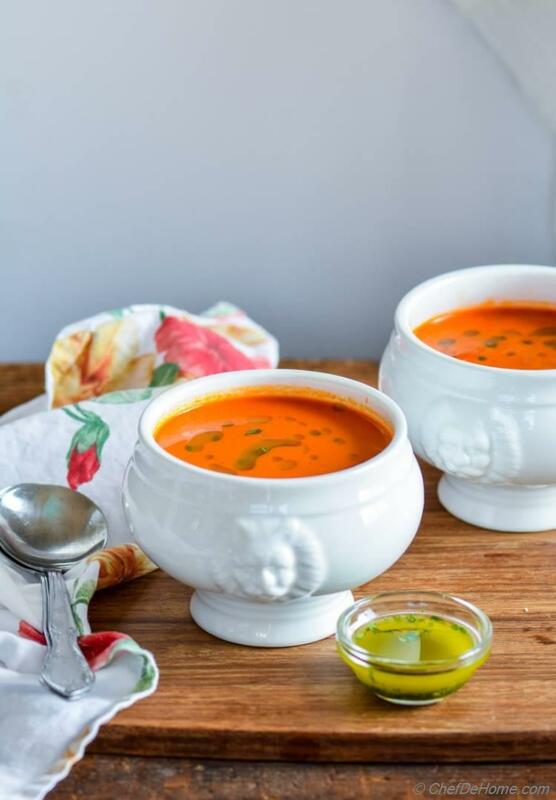 Sharing a delicious soup and few delicious feel good snacking bars. This post is sponsored by ZonePerfect. 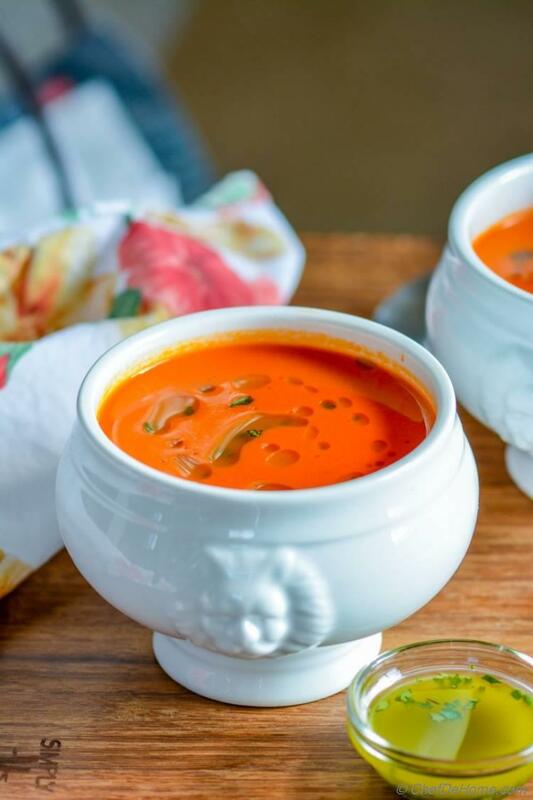 This Tomato Bread Soup is so creamy, and luscious yet has not even a drop of cream or butter in it!! Oh, yeah! Sharing today, an old fashioned household classic way of eating Tomato Soup thickened with plain old white bread!! This vegan tomato soup we enjoyed twice, bowl fulls, in past two weeks! And I'm still craving more while typing this post. 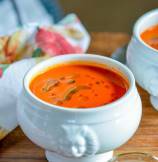 The silky smooth texture and lite flavor of this soup is comforting and sinfully addictive! 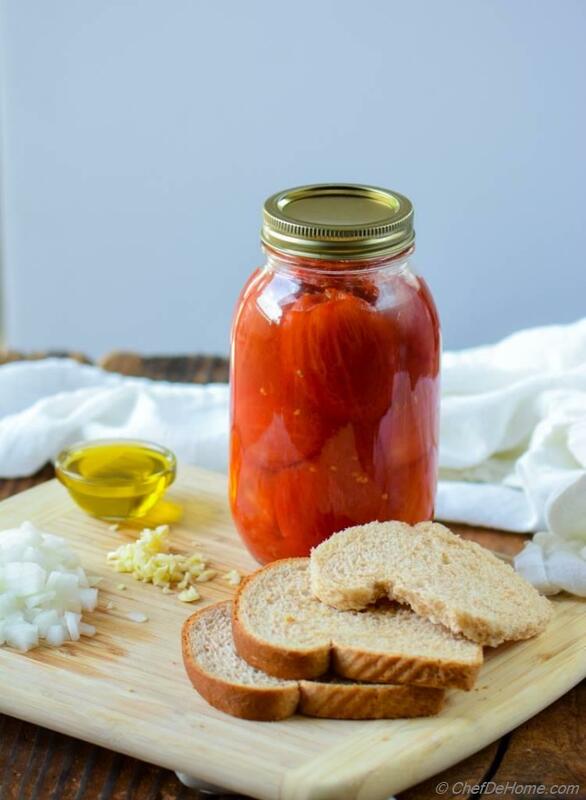 Tomato Bread soup does need some labor of love to cook the tomatoes with seasonings and bread to develop the flavor. But, I must tell you, it is so so worth the effort. In my honest opinion, one bowl of this soup and you will never eat canned tomato soup again. And also will not wait to buy cream to make a creamy tomato soup. Amazingly, it is finally little less hot in our part of the world. Feels like fall-winter season! Loving it Summer had been so so harsh all this year that we were longing for some cold weather..... Time to enjoy soups, stews, and lots of baking!! Not that sweet, but certainly savory baking! I'm sure you will agree, nothing is better than a warm bowl of soup with a fresh baked bread on a cold winter day! This, my friends, is a kinda dinner I can enjoy whole year! During my initial years of working in IT, I lived away from home and really soup and bread used to be my every dinner. A big bow of soup and some store-bought bread. Yes store bought. Why? Because I had no plans or idea of cooking yeast bread at home those days! lol! You can call it - lazy-bachelor-days! For lunch, I often enjoyed some fiber rich filling snack and soups for dinner. That's pretty much it! Pretty lean and healthy, isn't it? Speaking which, I must share with you about which I'm loving for fiber-rich snacking these days. Out of their wide variety of bars, my special favorites is Dark Chocolate and Cashew! Very less sweet, dark and chocolaty and also gluten free. These kind of snacks are my favorite to indulge in little me-time yet not break the calorie bank! Soup will stay good in refrigerator in an airtight container for 2-3 days. You can also portion it and freeze it to serve over the weekdays. If you can't find fresh basil these days. 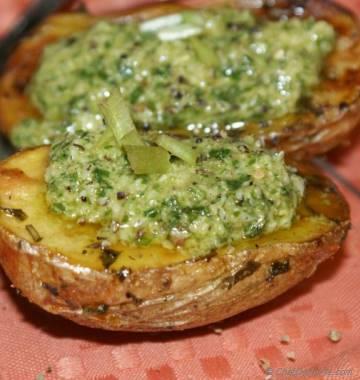 Use a teaspoon of basil pesto to each soup bowl. This will not be vegan since most pesto have Parmesan cheese. Note: If tomatoes you using taste very tart, feel free to add a spoon of cream (not vegan) or a vegan creamer. 2. 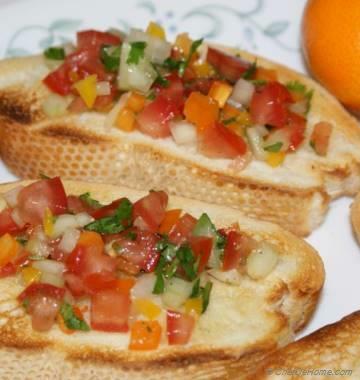 Add tomatoes with red pepper flakes (if using) and 1/4 tsp salt and then cook until tomatoes are soft (10-15 minutes). Break tomatoes with back of spatula while cooking. 3. Transfer tomatoes to a blender (careful these will be hot) or use an immersion blender to puree the tomatoes. Return to the pot, add vegetable stock and chopped bread. mix well. Cover and simmer for 30 minutes. 4. After first 20 minutes, make sure to check and stir the soup once or twice, since towards end of cooking, bread tends to stick to bottom of the pan. 5. After 30 minutes, almost half of soup remains. Puree it in blender or using immersion bender, then sieve through a fine mesh or food mill (optional). 6. To make Basil Oil, in a food processor, add basil leaves and olive oil. Process on high until basil is pureed. Remove in a bowl. 7. 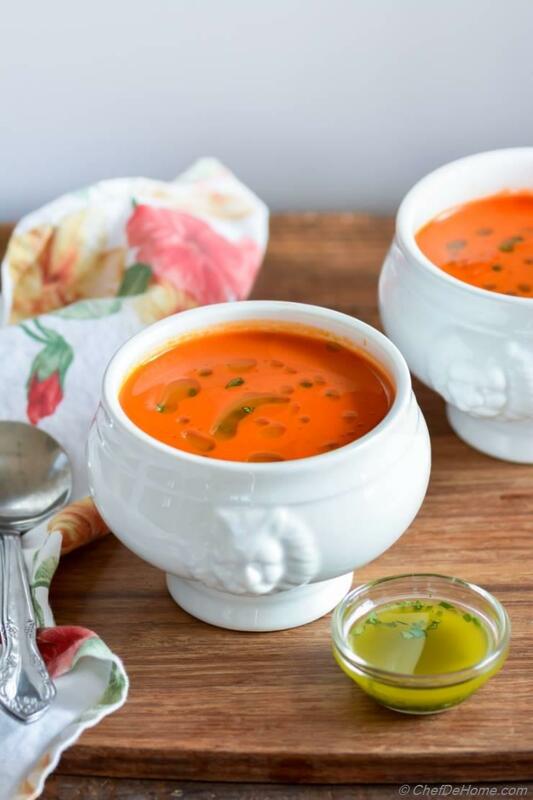 Serve soup hot with drizzle of basil oil and enjoy! sounds yum! never tried adding bread to my soup but I totally need to! I love soups this time of year! 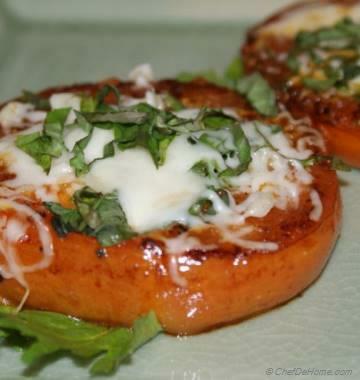 They are definitely my go-to when the weather gets cold and tomato is one of my favorites!